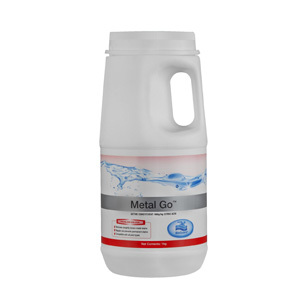 Removes unsightly brown metal stains from pool surfaces. Removes reddish-brown discolouration in pool water. Useful for pools exposed to common sources of iron, such as fill water, rural water sources, fertilisers, debris or lesser quality salts. Promotes clean pool surfaces and water. Regular use will prevent permanent metal stains. Can be used as maintenance, preventative or problem solver.